February 1, 2017 | Karen T. Willitts, Esq. I understand why you might not want to read this but . . . tax season is upon us. While I am an attorney specializing in family law, I frequently come into contact with other areas of law, such as criminal law, school law, health law, real estate law, elder law, bankruptcy law, and so on. While I am not a tax attorney, tax considerations do come into play in family law, especially divorces, sometimes by circumstance and sometimes by necessity. Please note that I am not an accountant, and your divorce attorney is probably also not an accountant. I do not intend this blog to be legal or accounting advice. If you have any questions about your tax obligations you should definitely consult an accountant. As I stated above, one of the statutory factors that a family court judge must consider is the tax consequences of an alimony award. When alimony is awarded, those payments are taxable to the spouse that receives them. Therefore, if the judge awards you alimony, you have to report that alimony on your tax return. You may have to file pay estimated taxes throughout the year. If you are employed and still receiving alimony, you may want to adjust your Form W-4 at work in order to have additional taxes taken out. If the judge directs you to pay alimony to your former spouse, you may deduct that alimony on your income tax return to reduce your income tax obligation. Child support payments, however, are not considered income taxable to the parent who is receiving child support payments, nor is the parent paying child support able to deduct those payments on his or her tax return. After a divorce complaint is filed, a court may direct one spouse to pay temporary or interim support (we call it pendente lite) support, with the intent to maintain the status quo as much as possible during the divorce litigation until the case either settles, or the court is able to conduct a full evidential hearing as to the parties’ finances. When the court orders this interim support, the judge may not allocate that support between support for the spouse and support for the children. Therefore, unless the judge indicates that this interim support is non-taxable in the court order, if the recipient spouse does not file a joint income tax return, that interim unallocated support is taxable if the recipient spouse files a separate tax return. Another support consideration to be aware of is that sometimes spouses may reach an agreement wherein a spouse receives an upfront lump sum award of money as a full or partial satisfaction of the other spouse’s alimony obligation. The IRS might confuse this lump sum payment as equitable distribution, which could be a problem for the payor spouse in terms of how to deduct it and whether to deduct it. If the termination of alimony is tied to an emancipation date of a child, the IRS may confuse those payments with child support. If equitable distribution of assets is paid over time, the IRS might confuse these payments of equitable distribution, which should not be taxable, with alimony, which is taxable. Consequently, if arrangements are made in a settlement to resolve financial disputes in a manner such as these, provisions need to be in the settlement agreement that address taxation issues. This often becomes an issue during a divorce litigation, when the parties are in the middle of a litigation still at tax time. Should they file jointly? Should they tile separately? If litigants were still married as of December 31, of the preceding year, they may file a joint tax return. For instance, if the couple was still married as of midnight on December 31, 2016, they may still file a joint tax return for 2016, even if they were divorced in January, 2017. If the couple was married for all of 2016, but divorced on December 31, 2016, they cannot file a joint income tax return for 2016. What if, on April 15, 2017, the parties are still in the midst of a divorce litigation and a tax return is due. They are not divorced. They were married for all of 2016 and they are still technically married although a divorce complaint is filed. Can they file a joint 2016 tax return? Yes they can. Should they file a joint income tax return? Well, that depends on the situation. If one spouse wants to file a joint income tax return to be able to take advantage of the tax deductions available to married persons filing jointly, that spouse may make an application to the court to either compel the other spouse to sign a joint income tax return, or to have that spouse bear the financial consequence of not signing a joint tax return. In such a situation the party seeking to file jointly would have to be able to show the court a draft of how the returns would appear based on filing a tax return jointly and individually so that the court. The spouse objecting to filing a joint return would need to have a reasonable explanation for not wanting to file a joint tax return. One good reason for not wanting to file a joint income tax return with the other spouse occurs, for instance, when the other spouse is self-employed and is considered to perhaps be manipulating his or her income for tax purposes. If one spouse thinks that the other is is dishonest or cheating on his/ her tax returns, then that is a reason why one might not want to sign the return, in which you are certifying to the IRS that the information on that return is correct. Sometimes a tax indemnification agreement may be signed to protect a spouse. If it is known or suspected that a spouse or both spouses is or was cheating on a tax return, this should raise more than one red flag. Where it involves the family court, you should be aware that pursuant to Sheridan v. Sheridan, 247 N.J. Super. 552, 556 (Ch. Div. 1990). In that case, the Court stated that “equity is an impermissible forum for the division of marital property primarily purchased with funds from illegal activities. A court of equity, as a court of conscience, can never permit itself to become party to the division of tainted assets nor can it grant the request of an admitted wrongdoer to arbitrate such a distribution. It is clear our court decisions reinforce this very principle: A court of equity can never allow itself to become an instrument of injustice.” The court further said, “Historically, courts of equity have reflected the collective public conscience of what should and should not be done. Equity involves the obedience to dictates of morality and conscience. The morality of which equity speaks is that of society and not the judge’s personal view of right and wrong. Likewise, equity may not disregard statutory law but looks to its intent rather than its form.” Id. at 552, 558–59. In essence, the family courts consider it their obligation to report litigants to the IRS when they are found to have filed fraudulent, dishonest tax returns. Now, the IRS has a tax form, Form 8857, which is a “Request for Innocent Spouse Relief”, which the IRS says should be filed as soon as a spouse becomes aware of a tax liability for which only the other spouse should be responsible. The IRS points out that they will notify the other spouse that this form has been filed, and that there are no exceptions, even for domestic violence cases. Be aware: it is not easy to get innocent spouse relief or protection from the IRS. Consider the following statement of the IRS: “Many married taxpayers choose to file a joint tax return because of certain benefits this filing status allows. Both taxpayers are jointly and individually responsible for the tax and any interest or penalty due on the joint return even if they later divorce. This is true even if a divorce decree states that a former spouse will be responsible for any amounts due on previously filed joint returns. One spouse may be held responsible for all the tax due.” To be an innocent spouse, it is difficult to show that you are truly unaware that the other spouse was being dishonest on a tax return that was jointly filed and signed. In such a situation where it appears that fraudulent or incorrect tax returns were filed, if the parties are not going to file amended correct income tax returns and pay any taxes and penalties due, some parties will settle the case to avoid a trial before a judge who would report them, or they may consider an alternative dispute resolution forum like arbitration, to make resolution of the case private. Among the things that a settlement between divorcing parties, or a decree from a court, must address are issues such as deductions for spouses who are going to be filing separate tax returns in the future. 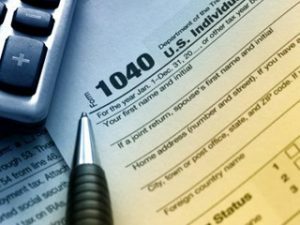 Post-divorce, the parties will examine what their tax filing status is going to be. Obviously, they are going to be filing individual returns. A custodial parent may qualify for head of household status. A person may qualify for head of household status if: (1) he or she is unmarried on the last day of the year; (2) he or she has paid more than half of the cost of maintaining a household that is his/her home and the main home of the child for more than half of the year; and (3) the child is either the person’s qualifying child (whether that person can claim the child as a dependent or not). The non-custodial parent would file a tax return as an individual. Post-divorce the litigants may have a dispute over deductions or exemptions. The parent with primary residential custody may claim the child or children as exemptions on his/her income tax return. In settlement, the parties may sometimes agree to share the exemptions or alternate them in some way. In such a case, the custodial parent would have to sign IRS Form 8332 in order to allow a non-custodial spouse to claim a child or children as an exemption. This can be a point of contention, however, where it might cause the custodial spouse to lose head of household status. Some spouses who are divorcing might desire or be forced to sell assets in order to equitably distribute assets acquired during the marriage in a divorce. Doing so may have tax consequences that should be considered. If a home or other real estate is being sold, there may be capital gains on the sale that must be allocated. There may be realty transfer taxes in some situations owed to a county. If stock is being sold, again there can be capital gains taxes to consider. One important consideration is the equitable distribution of retirement accounts like 401(k) accounts and/or Individual Retirement Accounts (IRA’s). Retirement monies saved during a marriage are subject to equitable distribution no matter whose name they are in. When they are distributed, if money is withdrawn from a retirement account in an effort to distribute that money, then early penalty fees may apply, and taxes may be owed on those distributions. Consequently, when dividing an account like a 401k in a divorce, you will need a qualified domestic relations order, which a special court order that allows a pension or 401k to be distributed to a non-employee spouse pursuant to a divorce decree; IRA’s can be distributed by rollover into another IRA usually.